Passur - thanoscardgamess jimdo page! This is a challenging fishing card game for four players in partnerships that has unique features. The dealer deals 4 cards to each player and four cards to the table, face up.One after another each player plays one card. He can either put a card to the ones on the table, face upwards, or capture cards from the ones on the table. Capturing rules are as follows: A king can get only a king. A queen can get only a queen. A jack gets all cards from the table apart of kings and queens. You can take pip cards if the value of the pips adds to 11. The Ace counts 1. For example, a player plays a 7. If there is a 4 among the table cards, he can take both the 7 and the 4. If there are two 2s he can take both 2s and the 7.If a player wins all the cards on the table (without using a Jack) he scores a sweep. After each player has played his four cards, the dealer gives each player four new cards, but no new cards for the table. 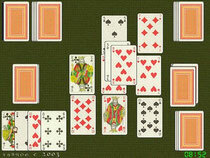 Valuable scoring points can give the majority of clubs, the 2 of clubs, Aces, Jacks and the 10 of Diamonds. This game is extremely popular in Iran. According to John McLeod (http://www.pagat.com), 'passur' in Iranian language is a general word for playing cards while this game is called either 'Chehar barg' or 'Haft va chehar, yazdah'. You may play it with a levantine 52 card deck or with a standard one.